What is the purpose of business? For what reason does it exist? What is—and should be—the core motivation of its owner(s)? Well, I suppose it depends upon whom you ask. Some politicians will tell you, with a straight face, that the entire reason businesses exist is to pay taxes. Taxes which, of course, the politicians can then spend on themselves and their voters. But if that is the case, what defines a successful business? How many dollars in taxes is enough? All you hear from them is, "More!" Labor leaders, for their part, will tell you that businesses exist to provide jobs. Good jobs. Union jobs, of course, with high pay and generous fringe benefits. But how many jobs? How high the pay, how generous the fringes? Again, all you hear is, "More!" Now, your average business school graduate can tell you the real purpose of business: To make money! But how much money...and for whom? The stockholders? The executives, who too often pay lip service to "increasing shareholder value" but then turn around and loot the organization as if it were their private piggy bank, writing golden parachutes and poison pills into their contracts in the event that some group of stockholders dare to join together and try to hold them to account? Suppose the executives and shareholders successfully negotiate a major merger deal which enriches all of them greatly...and leaves a century-old corporation as a mere paper shell of itself, with employees laid off and production moved overseas...have they done a good thing? At what point can you declare success? When is enough money enough? Do you hear anything except "More?" Think about it. If your foundational motive is to serve customers you will pay taxes, for the authorities who safeguard the civil society are worthy of appropriate tribute. To serve more customers than you can personally handle you will hire employees and you will pay them well, "...for the laborer is worthy of his wages" (Luke 10:7, NKJV). You will run the business so as to make a profit, for you also are worthy of reward for your investment of time and capital and energy and also because without ongoing profit you will be unable to serve your future customers, who are just as important as your past and present customers. Best of all, now you can define and achieve success: Every time a satisfied customer walks out your front door, you're a success! "And whosoever of you will be the chiefest, shall be servant of all." (Mark 10:44, KJV). From everything I have heard and read, the management of the Atchison, Topeka and Santa Fe Railway got this attitude in a way that few other organizations before or since ever have. They were genuinely motivated to provide the best service possible to the people of their operating area. They operated more premium passenger trains longer than just about any comparable railroad (I do need to give a hat-tip to the mega-merged railroads SCL and BN here), and the quality of the trains they operated put most of their competition to shame. They were among the last of the major railroads to drop LCL service for small shippers. The company and its employees kept a consistently professional attitude and quality of service when other railroads *cough* Penn Central *cough* Southern Pacific *cough* *cough* *cough* were just "mailing it in". And, if only there could have been an easing of the rules and the tilt of the playing field, they were prepared to keep providing that quality passenger service for the foreseeable future. Atchison, Topeka & Santa Fe Ry. Radio and recorded musical programs. Extra Fare. Courier Nurse. Dormitory Baggage Car...Chicago to Los Angeles. Turquoise Room-Pleasure Dome Lounge Car...Chicago to Los Angeles. Dining Car...Chicago to Los Angeles. Serves all meals. Dormitory Baggage Car...Los Angeles to Chicago. Turquoise Room-Pleasure Dome Lounge Car...Los Angeles to Chicago. Dining Car...Los Angeles to Chicago. Serves all meals. RULES FOR THE SUPER CHIEF, TRAINS 17 AND 18. 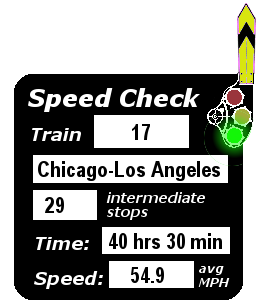 On Train 17, THE SUPER CHIEF, westbound advance reservations may be made from scheduled stops Newton and east to Barstow and beyond, also from Chicago and Kansas City to Albuquerque and from Albuquerque to Barstow and beyond. On Train 18, THE SUPER CHIEF, eastbound advance reservations may be made from Los Angeles, Pasadena, San Bernardino and Barstow to Newton and east, also from Los Angeles, Pasadena, San Bernardino and Barstow to Albuquerque and from Albuquerque to Kansas City and Chicago. Stop-over—Super Chief Extra Fare Tickets valid for stop-over at Flagstaff, Ariz., (only) when valid for passage through that point. Streamlined Train. Chair Car Passengers only. All Seats Reserved. Reservations Required. Radio and recorded musical programs. Dormitory-Baggage Car...Chicago to Los Angeles. Hi-Level Dining Car...Chicago to Los Angeles. Hi-Level Lounge Car...Chicago to Los Angeles. Dormitory-Baggage Car...Los Angeles to Chicago. Hi-Level Dining Car...Los Angeles to Chicago. Hi-Level Lounge Car...Los Angeles to Chicago. RULES FOR EL CAPITAN, TRAINS 17 AND 18. These trains will carry coach passengers between all regular scheduled stops excepting locally in Arizona. Extra fare. Almost alone among railroads of the early 1970s, Santa Fe did not consider passenger trains to be "obsolete" or, even worse, a "nuisance". Even though they were losing money, they insisted on maintaining the highest level of service...even on their third-string trains. They promoted and advertised their services extensively, and with the possible exception of a seldom-used branch line local or two I have never yet heard a traveler's report which claimed that a Santa Fe train was dirty or ill-maintained or that an employee was anything less than professional. Santa Fe liked operating passenger trains, and they were good at it. No, they were damned good at it! So why did Santa Fe drop its passenger service and join Amtrak? Well, the financial motivator was a powerful one. Santa Fe was definitely bleeding red ink in the passenger department and that could not be sustained indefinitely without damage to the organization. Still, that was not the whole story. Railroads had to pay a stiff up-front fee to join Amtrak based upon their passenger losses in previous years, and as Santa Fe had waited so long to cancel so many of their trains they had a larger loss to cover than most. Had they been allowed to drop a couple of the worst money-losers they very well might have changed their minds and continued operating the Chiefs. So while the immediate profit and loss was a big factor, it was not the only one. Another possible motivation was access to stations, especially in Chicago. Santa Fe had always been a tenant at Dearborn, never an owner, and the owning railroads had made it crystal clear that Dearborn Station's history as an active passenger terminal would come to an end with the arrival of the last trains dispatched on April 30th, 1971. Santa Fe had investigated the possibility of moving to Union Station with Amtrak...but Amtrak's managers were not from a traditional railroad background, where access to things like stations and detours and trackage rights were based on an equitable sharing of expenses. Amtrak's management believed that they were the only game in town and felt no compunction about raking the holdouts over the coals for all the cash they could bear. Yet there were other alternatives here as well. Rock Island, for example, was still operating its commuter services and its last remaining intercity services out of cavernous La Salle Street Station, and it seems a safe speculation that they would have leapt at the opportunity to share expenses with a prosperous tenant like the Santa Fe. So station availability was not the deciding factor. Along with availability of stations was availability of new equipment. The equipment for the "new" Super Chief was by this time twenty years old; most of El Capitan's Hi-Level coaches were pushing fifteen. With no new orders to sustain them the remaining car builders were slowly dying as skilled employees and equipment suppliers faced unemployment and bankruptcy. Still, Santa Fe had an excellent equipment maintenance program and properly maintained passenger cars can last a long, long time...much of Canadian Pacific's 1955 equipment for the Canadian is still in service with VIA Rail Canada more than 60 years later. Both Budd and Pullman-Standard would complete major equipment orders for Amtrak in the 1970s; Santa Fe could conceivably have gone to that well also. Equipment was a concern, but it was not the deciding factor. So, what was the deciding factor? According to Garl Latham and his conversations with former Santa Fe president John S. Reed, it was...liability. Railroad management had observed the increasing litigiousness of American society with great concern. Long gone were the days when a passenger who had been "shaken up" in a derailment would consider himself made whole with ten dollars and a pair of free tickets to the destination of his choice. A major accident with multiple fatalities could conceivably bankrupt even a prosperous railroad like the Santa Fe...indeed, its deep pockets made itself that much more attractive a target. The legislation that created Amtrak promised to relieve the railroads of all liability for passenger operations. ALL liability, even for accident causes which would normally be laid at the feet of the host railroad such as bad track or a dispatching error. This, according to Garl, is what tipped the balance and finally convinced Santa Fe management to turn passenger train operations, and the Super Chief/El Capitan specifically, over to Amtrak. At the time it was handed over, it was beyond question the finest passenger train service in the world. Original timetable information copyright ©1971 by National Railway Publication Company. It is believed that the noncommercial use of this out-of-print material to document the history of the North American passenger train constitutes Fair Use under U.S. copyright law. The Santa Fe herald is a licensed mark owned by BNSF Railway Company. Santa Fe Railway herald obtained from BNSF Railway. All comments, original material and page design copyright ©2006-2016 by Eric H. Bowen. Page created 2016-07-04.